The combination of personal service and total product life-cycle support adds value to the components you purchase. Excellent logistics make sure that parts ordered get to you in the shortest time possible. And our support services around the world are ready to meet your after-sales needs, including on-site visits. 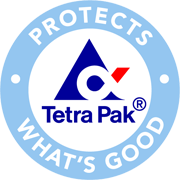 The attention to detail as part of Tetra Pak’s personnel adds to the convenience and timesaving benefits you gain from a single-source supplier. In our environmental work we focus on the performance of our products in use, identified as our most signifi cant environmental impact. Important aspects are reduced energy and water consumption, minimal loss of food product, control of substances in the components, and that they are prepared for dismantling and reuse of materials when taken out of production. The manufacturing of components at our suppliers is also subject to our continuous environmental work in order to minimize their environmental impact. The work is performed with the support of our environmental management system, certified according to ISO 14001. This is not a technical catalogue, therefore full technical specifications are not included and we reserve the right to alter details and information over time. We have endeavoured to ensure that all details in this catalogue are correct at time of publishing. No responsibility will be taken by any omission or errors in this catalogue.